This post is sponsored by CANIDAE® Pet Food and the BlogPaws® Pet Influencer NetworkTM. I am being compensated to help create awareness about the Grain-­‐FreePURE® line of pet food but we only share information we feel is relevant to our readers. CANIDAE is not responsible for the content of this article. One of the great things about being a blogger is getting to talk to my readers about wonderful brands like CANIDAE® Grain Free PURE. Like my readers my dogs are important to me. I want to feed my dogs only wholesome nutritional food that has good reviews from customers like myself. CANIDAE® Grain Free PURE is such a brand, and I trust this brand to deliver high quality dog food that my dog will thrive on. CANIDAE® Grain Free PURE has sweet and white potato in it so unfortunately my boy Jasper cannot eat this food but Scotchy can, and as the picture shows he is excited for that opportunity. The best part of getting to try CANIDAE® Grain Free PURE is simple recipes for sensitive pets made with fresh meat and whole foods that is always first on the ingredients list. Feeding a high quality dog food ensures that your dog grows healthy, and has the right amount of energy to handle day to day activities. Good quality food like Canidae®’s products also means less trips to the vet because good quality food means healthier dogs. CANIDAE® Pet Food Company started out as a family owned company, and they still are today. They are one of the last, true independent companies making pet food—and they will continue to be. From the first truckload of pet food they delivered from the back of their pick-up trucks to the latest batch cooked up at their Ethos Pet Nutrition plant in Brownwood, Texas, their story is one they are proud of. They started out as pioneers in the pet food industry with one goal in mind: Make the best pet food possible. They’ve been doing that now for almost 20 years. And they’ll keep on doing it, one bag at a time. Canidae® is a great company, and because of their history with providing high quality pet food I feel comfortable recommending them to my readers. Scotchy is a foodie, and like most foodies they know good food when they smell it. 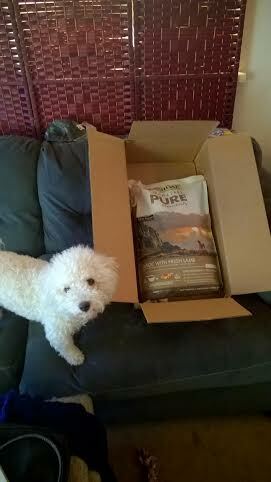 So I wasn’t surprised that Scotchy nearly ripped the box open when it arrived holding the Canidae® food we get to try. My dogs enjoy high protein kibbles without fillers, and Scotchy prefers meaty type treats over biscuits. Scotchy likes that the main ingredient in the bag we got to try is Lamb. Lamb is actually is favorite protein, and is a safe protein for my allergy job, Jasper. I like that Canidae® does not use chicken by products, is soy, wheat, and corn free. They have been independent and family owned since 1996, and are a pet food company made by pet loving people. I prefer to feed both of my dogs a grain free diet that includes probiotics for easier digestion. Canidae® is a grain free limited ingredient diet with 7-10 key ingredients. It also contains healthPLUS solutions in every bite, and contains probiotics added to the kibble after cooking to ensure your dog benefits from healthy digestions. There’s also antioxidants, and Omega 6 & 3 to help support beautiful skin and coat. My Scotchy really seemed to enjoy this food. If he does not like something he will refuse to eat it, and he immediately started eating this food with no problems. Receive up to $8 in Canidae coupons!